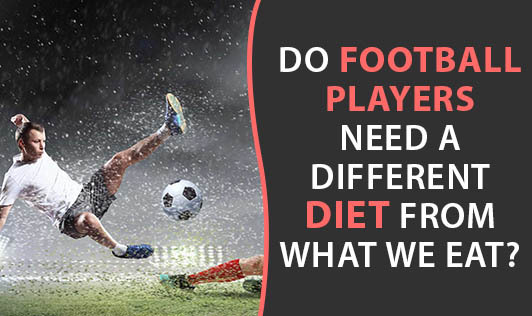 Do Football Players Need A Different Diet From What We Eat? Yes and No. Yes, the quantity is greater but no the quality of diet is not different from what we eat. Their requirement for energy is much higher than ours. So, they need much more calories than we do. These calories come mainly from complex carbohydrate foods like corn, bread, oats, bananas, potatoes and pasta. In our Indian diet, it would be rice, roti, bread, ragi, etc. Some amount of energy also come from fats like cheese, butter, and sugars like jam, jelly, dry fruits, honey, fruit drinks, etc. Their protein requirement also increases accordingly, and meats, nuts, pulses, dairy and eggs can fulfill this. Hydration is also a priority - water and sports drinks are most useful. Basically, the variety of nutrients for all of us remains the same. The footballers too need all the nutrients that we need - carbs, proteins, fat, vitamins, minerals, fiber and antioxidants. So, if you wish to eat the way footballers do, make sure you can burn off the 5000 odd calories in a day, like them!